Rico on the right and his friend Giacchino at a cafe in Goodge Street. The friendly face of Enrico (Rico) Fumagalli will no longer be seen in his favourite Fitzrovian haunts because he died at his home on the night of 24 and 25 October 2011. He was 65. 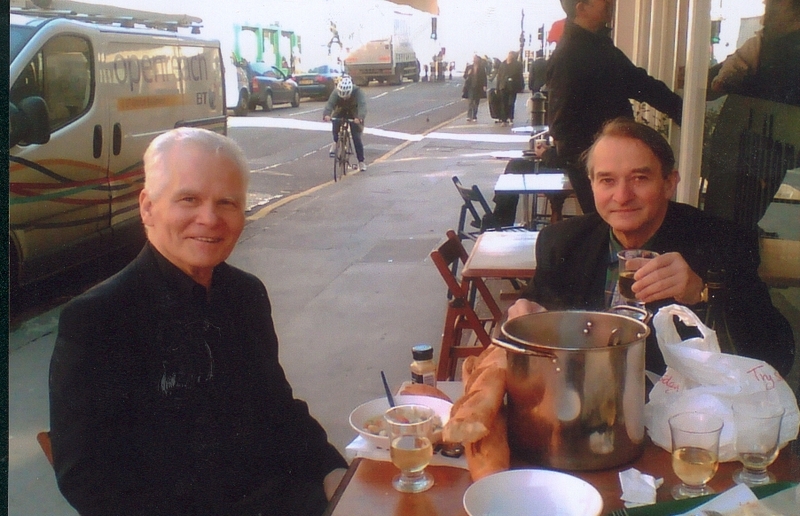 He had been suffering from multiple tumours but he bravely kept going to his favourite places because he loved eating and drinking (The restaurant Di Montforte was one favourite) socialising and visiting seaside resorts like Brighton. Briefly married to a swiss doctor, he was widowed five years ago. There were no children. Rico came from Bellusco a town near Bergamo in North Italy 20 years ago. He had sold a construction company and had gone to live in Thailand for one year prior to his arrival in London. Here, he held the prestigious job of Duty Manager of the Spaghetti House in St James. His friend Giacchino Labrutto told me he had known him 20 years, because they lived in the same block in Charlotte Place for the past two decades. His friend Radames Bonaccosi-Ravelli, was an old family friend from Bergamo, who helped him manage his medications. Both friends described him as funny, open minded and generous. A regular customer at Icco and at Felice’s Italia Uno in Charlotte Street, where Claudia Schiera told me he came every day to drink tea like an English man with his friend & workmate, Sandro. He also loved Molly Moggs, the bar/cabaret in Soho and the stylish,extraordinary performances there . His funeral was in Bellusco a small town near the City of Bergamo on 18 Nov 2011. He will be sorely missed by all of us in Fitzrovia who knew him.